Everyone who has been part of one, dreads being summoned to a deposition. Specifically, you are called to the carpet by a lawyer who has every incentive to get you to support the conclusion they want. Lawyers know that with the benefit of hindsight, no accident is unpreventable. The accident happened but the question would be – what did you do to avoid it? Using past and current project images to inform safety practices is a good answer to that question and helps further support what you do to make your jobsites safe. Artificial Intelligence (AI) is now being applied across industries at many levels of technological sophistication. Some companies are moving beyond the capability of training AI to observe to training AI to predict the future. This new frontier in AI and predictive analytics is being applied to construction safety risk right now. 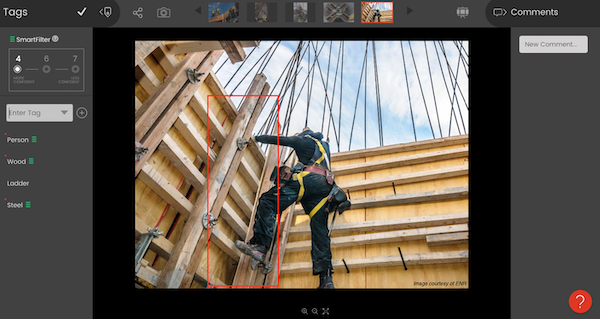 Smartvid.io’s AI engine, nicknamed “Vinnie”, analyzes photos coming from construction management systems like Autodesk BIM 360, OxBlue site cameras, and Procore. Safety personnel and risk managers are alerted if a project is at risk for an incident through trend reporting and the images that show indicators of risk. This is why being grilled at a deposition would be better for a person on a team that uses Smartvid.io. When you can say that you use the most modern, sophisticated monitoring systems that feeds data to your teams, that you communicate this information to the people on projects who could use it, you can show that you take the extra steps to improve safety. The deposition lawyer won’t like this answer. They won’t give up the case. They will try a series of simon-says type questions to trip you up into some kind of admission. But the fact to return to is that by incorporating safety tools like those found in Smartvid.io, you are showing that you care enough about safety to use traditional inspections and meetings as well as the most modern, smartest tools to inform an all out safety effort.